Tom Clancy's The Division 2 Ultimate Edition is rated 4.5 out of 5 by 2599. 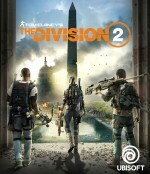 The Ultimate Edition includes additional digital content, the Year 1 Pass, and three-day early access to the game. Includes the Elite Agent Pack with exotic assault rifle, unique skill effect, and additional stash space. Includes the Battleworn Secret Service Pack with Battleworn Secret Service outfit, emote, and weapon skin. Also includes the First Responder Pack with First Responder outfit and First Responder weapon skin.